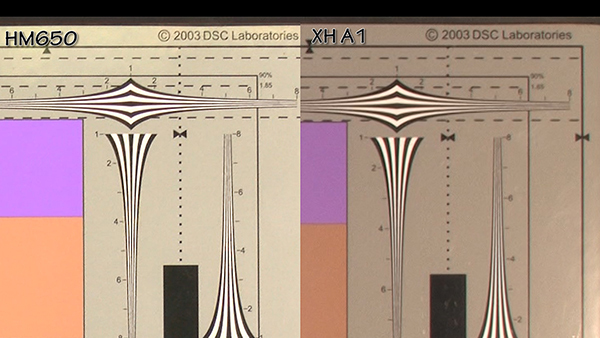 In performance testing, the JVC GY-HM650 produced exceptionally sharp quality. It offers very good manual controls and outstanding auto-mode performance, and shoots very well-balanced pictures in a range of lighting conditions. One feature I absolutely loved was the ability to set the upper and lower values for zebra stripes (Figure 3, below). 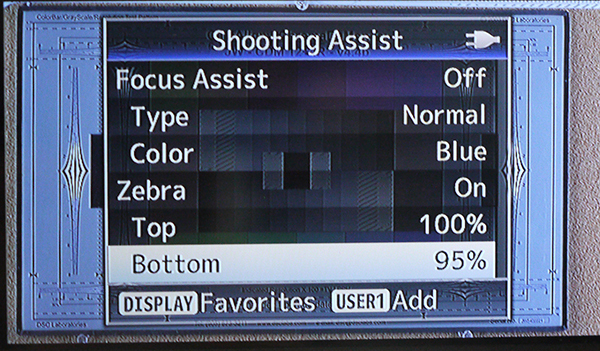 As you probably know, zebra stripes help set exposure by painting stripes over any region in the frame that’s at the IRE brightness value set in the controls. For example, in Figure 3, the camera would show stripes over any image region where the IRE values were between 95 and 100 IRE, useful when shooting a test chart since excessive IRE can cause loss of detail. Figure 3. I loved the ability to set upper and lower limits for zebra stripes. The problem with most camcorders is that when you set the IRE value at 70 for facial regions, the upper level ending point is undefined, so you can’t tell if the exposure is 70 IRE, which is OK, or 100 IRE, which isn’t. In Figure 4 (below), I set the top value at 75 and the bottom value at 70, which tells me that all painted facial regions are perfectly exposed, but not overexposed. If you shoot a lot of interviews and similar videos, you’ll find this invaluable. Like speed in baseball, image sharpness never has an off day, and the HM650 that I tested excelled in this department. Because of the space constraints of this article page, the image in Figure 5 (below) isn't full resolution, but you can click on the 600px image below to see the 1920x1080 version. On the left is the HM650, on the right is a much older Canon XH A1 with which I still do most of my shooting. The difference in sharpness is profound; overall, the HM650 produced some of the sharpest images that I’ve ever tested. Figure 5. JVC on the left, Canon XH A1 on the left. I’m of two minds when it comes to performance in auto mode. First, like all shooters, I like to think that I can fine-tune exposure and white-balance controls in the moment better than any engineer can via the algorithms, processes and assumptions remotely programmed into the camera months or years before. On the other hand, I know that when I’m trying to follow a dancer jete’ing across a high school stage with grossly uneven and ever-changing lighting, I need to let the camera handle exposure and white balance. Sometimes, you have to let the camera do its thing. Not all cameras can do this. For example, auto-gain control on the XH A1 produces an exceptionally noisy, almost snow-like image, reminiscent of the post-bridge scene from It’s a Wonderful Life, when George Bailey runs through town after getting his wish to live again, and finding Zuzu’s pedals in his pants pocket. 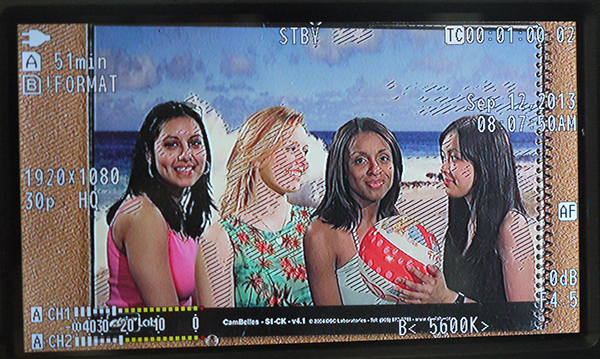 Wonderful scene, but not something that any camcorder should want to emulate. In contrast, the HM650’s auto-mode is embarrassingly good, so good that you wouldn’t want a client looking over your shoulder when you compared manual and automatic operation, something I always do on a shoot to ensure that my manual settings aren’t way off base. 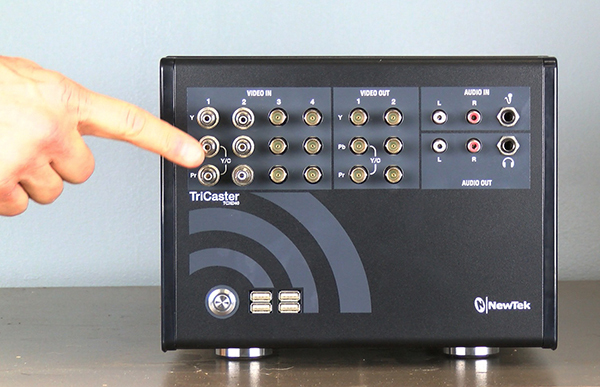 I did some of my testing on this camera while shooting a tutorial on webcasting with the NewTek TriCaster 40, shown in a screen grab from the HM650 footage in Figure 6 (below). In several of my test shots, I set white balance and exposure manually, and then flipped on auto mode; in all instances, auto-mode was better. Not “what the heck were you thinking?” better, but, “Yeah, you’re right, the image was a bit hot and looks more natural now,” better. Figure 6. Image quality, white balance and exposure in auto mode were all very, very good. Shawn Lam and Dave Walton discuss the JVC GY-HM650 2.0, JVC's newly updated dual-card/dual-codec ProHD camcorder with built-in FTP and live-output capability and a 23:1 Fujinon lens. JVC's new GY-HM600U ProHD camera incorporates very high-quality components, has a range of useful features, and in my tests captured very sharp video. If you're in the market for a sub $5,000 camcorder, the HM600U should be on your shortlist. JVC's GY-HM650 is a new three-chip CMOS camcorder with computer-like functionality that enables Internet connectivity and a second encoder that enables shooting and storing two different formats to SD card, or storing one format and transmitting live streaming video. Part 1 of this 2-part review details the mechanics of the online and dual-codec capabilities. In the second, we'll look at the GY-HM650 as a traditional camera and test quality and usability.